We would love to hear from you! Please drop us a line with questions, comments or to book an appointment. We are located at 28 Park Road, which is one block north of Bloor St and one block east of Yonge St (just behind the Hudson Bay Center). 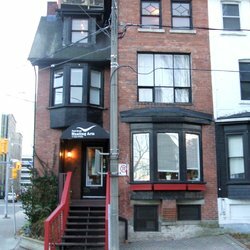 Our naturopathic clinic is on the third floor of a Victorian brick house in the Park Road Healing Arts center at the corner of Church Street and Park Road. By TTC: We are about a 3-5 minute walk from the Yonge-Bloor subway station. Exit to the north platform labelled “Bloor Street North Side”. Follow the sign to Park Road and walk through the underground shopping until you reach the Park Road exit. Turn left (north) onto Park Road and we are just up ahead at the the corner of Church Street and Park Road. By car: Parking lots are available at the Bay and Canadian Tire. Metered parking and street parking is available on Park Road, Asquith Road, Rosedale Valley Road and other surrounding nearby roads.